OS Grid Reference: SD 7368 4266. In the grounds of Waddow Hall (south-side) beside the River Ribble at Brungerley Bridge, near Waddington, Lancashire, is a sacred well that is locally called Peg O’Nell’s Well or Peg’s Well, but should perhaps be re-named ‘St Margaret’s Well’. It is probably a pre-Christian spring. Standing next to the well is a headless statue of Peg, who was a servant girl at Waddow Hall a couple of hundred years ago. But, it would seem the statue is actually that of St Margaret of Scotland, or maybe St Margaret of Antioch, an early 4th century martyr, and which may have come from a local abbey or Catholic church? The name Peg or Peggy being the diminutive form of Margaret and Nell being a short form of Helen. In folklore, however, Peg is a water spirit or sprite (similar to Jenny Greenteeth, perhaps) who inhabited the River Ribble at Brungerley Bridge; the well being the sacred place where the sprite dwelt and was able to move underground by a tunnel that connected the well to the river. The 17th century Waddow Hall is now a hotel and activity centre for girlguides in the northwest. Walk along the driveway (footpath) to the hall from Brungerley Bridge on the B6478, and then best to ask for permission and directions to the well. In an article published in Pendle & Burnley Magazine (1987) called ‘The Legend of ‘Poor Peg’, tells that: “Whenever an un-common amount of accidents happen around one particular spot, whisperings of an ‘evil spirit’ or ‘malevolent presence’ will abound. Centuries ago there occurred such a series of unexplained incidents along the stretch of the Ribble near Brungerley Bridge, Clitheroe. “Before the bridge was built (during the early part of the nineteenth century) all travelers were compelled to cross the Ribble at this point using the old “Hipping Stones’. “The local inhabitants, in attempting to explain the numerous misadventures and drownings, blamed them all on an evil water-sprite, who demanded sacrifice. It soon became the custom to placate the sprite by drowning small animals in the river, with the hope of avoiding the necessity of a human victim. Time passed by, and the frequency of the accidents decreased. The legend became almost forgotten, until the untimely death of a young servant girl. “Peg O’Nell was in service at Waddow Hall, over a hundred years ago. Her mistress was not an easy woman to work for, according to local account. Some reports indicate that she was regarded as being a witch. Whatever the truth, the Hall at that time was not a happy household. Maybe the servants, when huddled together on cold winter nights, regaled each other with tales of witches and sprites, eventually going to bed both tired and frightened. It was possibly on such a night, with the wind rattling the window panes, and the rain pounding on the ground outside the house, that Peg and her mistress engaged themselves in a heated argument. Obviously Peg was not a girl who took kindly to abuse, but in answering back the lady of the house, Peg only increased the woman’s wrath. 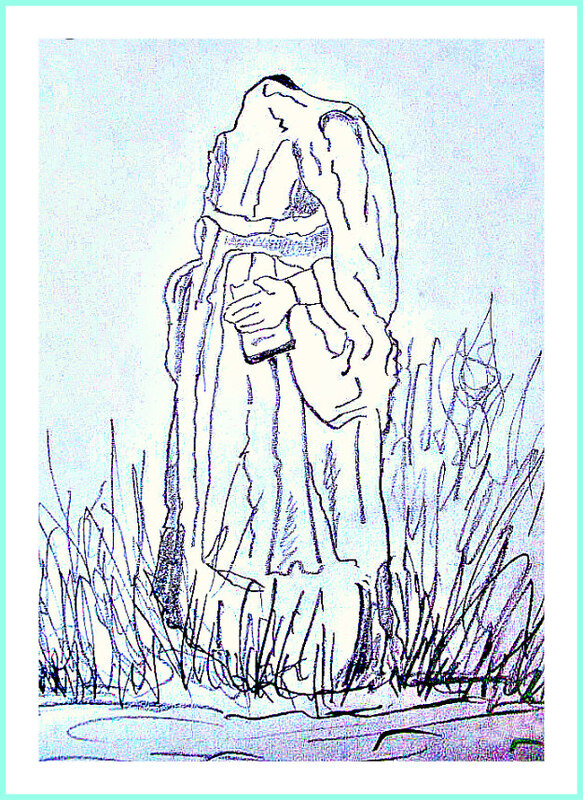 More out of spite than necessity, Peg was sent to fetch some water from the river (or the well). In the chilling night air, with the wind lashing her face and body, Peg stumbled toward the Hipping Stones. Her feet constantly slipped on the sodden earth bruising her arms and legs. Her anger soon turned to misery. With the final words of her mistress ringing in her ears “‘may you break your neck and die”‘, she stooped to fill the pails. Peg was never seen alive again. Next day her drowned body was found by the river, her neck was broken. The water sprite had claimed another victim! From now on there would be two restless spirits to trouble the inhabitants around Brungerley Bridge. Carole L. Nelson (1998) in her article for ‘Source—The Holy Wells Journal’, tells of her visit to the well: “It was comforting to learn, before I embarked on my visit to the well with my family, that the curse was in due course, broken. The guide tells of how a young male traveler was warned against crossing the Hipping Stones, or stepping stones, at Brungerley Bridge by an innkeeper who considered the river to be so swollen as to be unsafe. The innkeeper tried his best to dissuade him from crossing by adding that it was Peg’s Night but the traveler merely laughed and replied that if he died he would make sure that Peg O’Nell did not trouble the community again. He set off on his horse and was never seen again. His disappearance marked an end to Peg’s reign of terror at the well. Alternately, the name and the servant girl story may have been a means of protecting the true identity of the statuette. Because some individual or group of individuals had obviously taken pains to secure its rescue it is possible they were Catholics. With a fictitious, non-religious cover story the statue, and those who protected it would have been less likely to suffer retribution at Protestant hands. “The figure is now set in concrete to protect it against theft. Its base is a roughly cut rectangle and no feet are visible. One hand holds a stem of a flower or perhaps a scepter whilst the other holds a book. The back of the figure has no detailed sculpture, suggesting that in its original location it would have stood against a wall or inside a niche. John Dixon (1993) tells that: “Kept in the farmhouse at Brungerley is the figure of a woman carved in oak. Sadly the figure was slightly damaged by a barn fire some years ago, but thankfully rescued by the farmer. Upon examination the figure shows to have been once highly painted. The style of costume and headgear depict a woman from the medieval period — St Helen, wife of Constantine?” St Helen, as we already know, is the patron saint of the nearby parish church at Waddington. The village of Waddington and also the hamlet of Waddow take their names from Wadda, an Anglo Saxon chieftain who, according to legend, resided here way back in the mists of time. Terence W. Whitaker (1980) adds more about the statue beside the well. He says that: “The headless statue still stands near the Hall, I believe, but who she really is and who brought her here can only be speculation on my part. It is possibly a statue of St Margaret, most probably it was brought from Sawley Abbey during the Reformation, and possibly damaged during the violent days of the introduction of Protestantism, in the reign of Edward VI. Whoever it is and wherever the statue came from, for a great number of years the figure was associated with any evil happenings that took place in the vicinity. Bord, Janet & Colin, Sacred Waters, Paladin Books, London, 1986. Dixon, John & Phillip, Journeys Through Brigantia, Volume Nine: The Ribble Valley, Aussteiger Publications, Barnoldswick, 1993. Nelson, Carole L., Peg O’Nell’s Well, Source — The Holy Wells Journal, No.6, Swn y Mor, Mount Pleasant, Swansea, Summer 1998. Pendle & Burnley Magazine, The Legend of ‘Poor Peg’, Valley Press, Ramsbottom, Bury, Lancs, 1987. Whitaker, Terence W., Lancashire’s Ghosts and Legends, Robert Hale Limited, Clerkenwell Green, London, 1980. © Ray Spencer, The Journal of Antiquities, 2018. 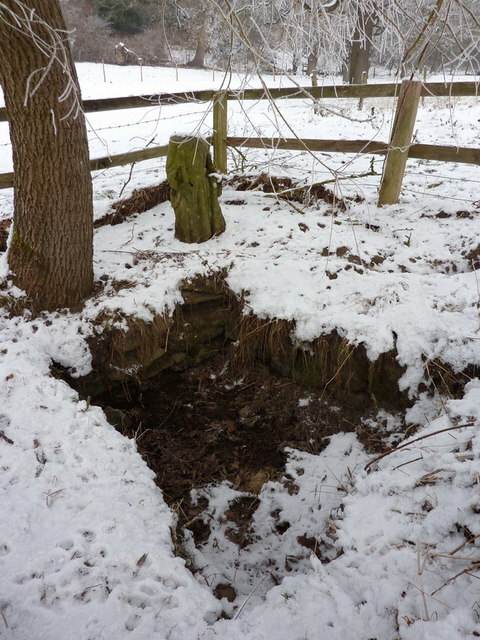 Categories: Sacred Well | Tags: Peg O'Nell's Well at Waddow Hall near Waddington in Lancashire | Permalink.